Cannes is the small town with the wide range of things to do. Whether you are coming to Cannes on your summer holiday or enjoying the sun and in the fall or spring, there is always something to do. The combination of relaxing beach life and vibrant city life makes Cannes a very attractive place for holiday. In Cannes there are 7 km beaches of fine light sand that are always popular among both children and a little older. There are both nice public beaches and beaches that belong to the big hotels or to beach restaurants where you can rent sun bed and umbrellas or enjoy your lunch. Whether you choose a public beach or rent a sun bed, the beaches hold the same high class and are cleaned every morning to prepare for the new day. Popular beaches include Plage du Midi which begins at the old port and then stretches all the way to La Bocca or the beaches along Boulevard de La Croisette. Bijou Plage is a very popular beach in the area of Palm Beach. Beach life in low season symbolizes primarily relaxation and the good life. You usually have good bathing weather also in October. If you want to stay near the beach we have the apartment for you! The Lérins Islands (in French: les Îles de Lérins, pronounced: [lɛz‿il də leʁɛ̃]) are a group of Mediterranean islands off the French Riviera, near Cannes. 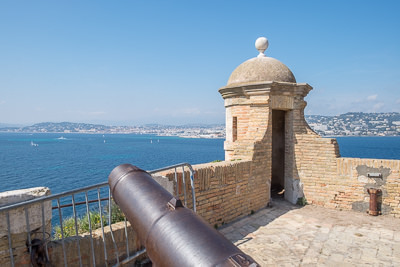 Île Sainte-Marguerite is the largest of the two and is best known for Fort Royal where the man with the Iron Mask spent many years of his life. The island is also an outstanding natural heritage with 150 hectares of a forest of eucalyptus and Aleppo pine trees and beaches with crystal clear waters. Île Saint-Honorat is the smaller of the two with a monastery founded by Saint Honorars around the year 410. According to tradition, Saint Patrick, patron of Ireland, studied here in the fifth century. The monks share their time between prayer and produce red and white wines, honey and lavender oil that you can buy in the shop right at the entrance to the monastery. You can also stay in the monastery for a few nights and experience the true monastic life, listening to the church bells, have the meals together with the monks and meditation in their wonderful garden where you can forget about the outside world for a while. 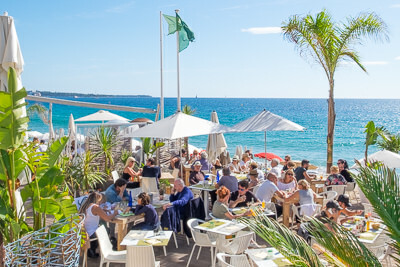 At Île Sainte-Marguerite there are restaurants open during high season. Our suggestion is that you do like most French people - pack for picnics and enjoy a full day in a genuine landscape that existed all over the river before the small fishing villages grew to today's towns. Boats depart several times a day from the View Port (Old Port) in Cannes. Just follow the signs. Every summer, some of the world's leading fireworks champions compete in an international championship. During July and August, you can enjoy a total of six contest contributions that for many become a memory of life - a harmonious mix of fireworks and music. The fireworks start at kl. 22:00 and will last for at least 25 minutes. Deployment takes place from four barges that are anchored outside the bay about 400 from the beach along the Boulevard de La Croisette and about 115 m apart. The central is located just outside the Hotel Carlton. This is also the best place to experience the show. Be prepared for a lot of spectators so if you want to sit on one of the blue chairs along the Croisette you have to be out on time, preferably 20:00 or a little earlier. You can also see the fireworks from other places in Cannes and the top of Le Suquet is usually popular. Le Suquet (old town) is the heart of Cannes, the oldest part of the city, with narrow streets, narrow alleys and steep stairs, up to the church where you can enjoy a truly wonderful view of the city and the bay. In the evening when you see Cannes wrapped in all the lights from the facade lights, streets and restaurants. Here is also the Musée de la Castre - Cannes old castle, constructed by Lérin's monks in the 9th century. Nowadays a museum with fine archaeological and art history collections. The view from Tour de la Castre is worth the whole entrance. If you want to stay in Le Suquet, we have the apartment for you! For three days in August, the beach at Palais Des Festivals transforms into a large dance floor that can welcome up to 10,000 partygoers to dance to 40-50 different artists, bands and DJs. From minimal techno to big room house, feel the sand between the toes and dance all night! 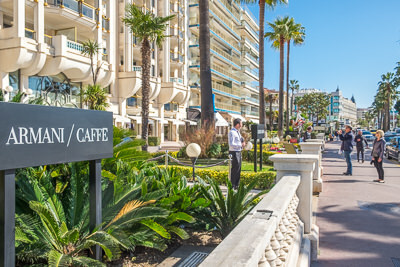 If there is anything associated with Cannes, in addition to the Film Festival, it is the Boulevard de La Croisette that extends throughout the bay, from the old harbor to the new yacht harbor. Here you find the large hotels like Carlton, Martinez, Majestic and all fashion stores like Chanel, Louis Vuitton, Gucci and Armani. Along the Croisette you have both public beaches and beaches belonging the hotels or restaurants. So do like many others, take a slow walk along the Croisette, sit down on one of the classic blue chairs just relax or watch the others, maybe buy a glass or enjoy a lunch at the beach and continue on in the same calm pace - no stress in Cannes! If you want to stay near the Croisette we have the apartment for you! If the boats are your passion, the Cannes Yachting Festival is the event for you. 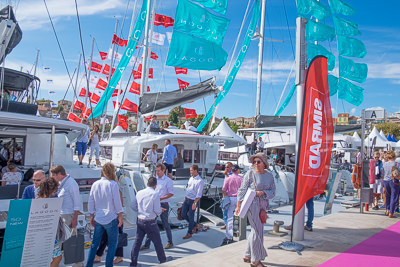 The Cannes Yachting Festival in September is Europe's leading floating boat fair with nearly 600 boats, from small boats of 2.5m to larger on 50m. You can go aboard, study at all the details and experience a wonderful sense of luxury and fortune. The exhibition grounds are the two ports of Cannes: Vieux Port and Port Pierre Canto. A boat takes you between them several times a day. The most beautiful yachts in the world from the best yards are in Cannes! as well as luxurious and prestigious brands. And of course, a whole host of accessories, equipment, fashion, and other things that belong to the yachting industry.